We can create all kinds of land art and street art. We create 3D anamorphic street art. This can be on a pavement, a road, or even across multiple levels and over objects such as benches and corners of buildings! We can also make huge pieces of land art on all mediums. We can also paint the pavement art onto a canvas so that it can be delivered to you and used multiple times and at different locations. We are constantly innovating in this area of our work, working out new ways to make things possible. Here are some case studies of past work. 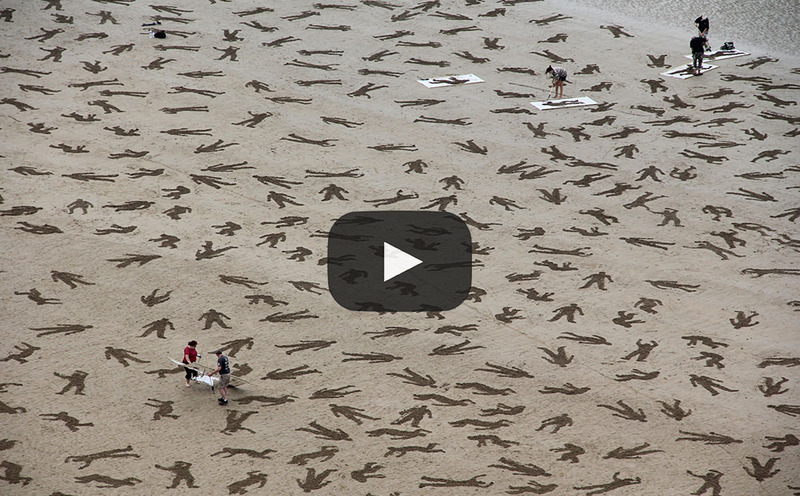 We have created some truly incredible pieces of land Art in the past. 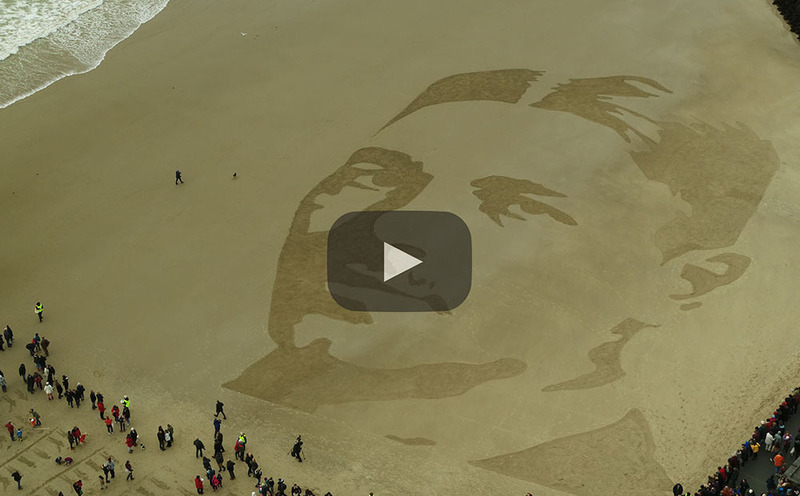 Our most notable ones are The Fallen 9000, Land Rover 1km sand drawing and most recently we headed up the design, training and activation of the sand drawings for Danny Boyle's Pages of the Sea. 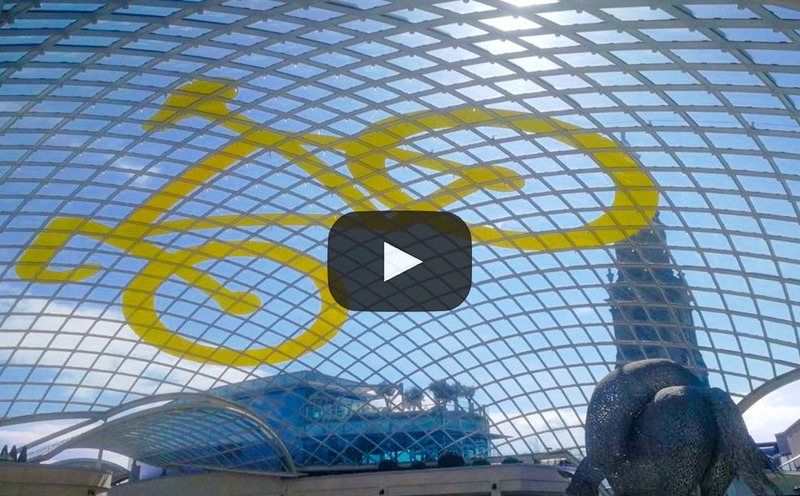 We developed, designed and created a 35 metre bike on the glass domed roof of the Trinity Shopping Centre in Leeds. Click to find out more. We created these two examples of anamorphic road art in the past 2 years for Bradford Council. These are semi permanent road paintings. Click to find out more. We can create images that are anamorphic and can go across multiple surfaces. These can be temporary or permanent. We create these onsite for all occasions. Click to find out more. We can create 3D street art paintings that people can interact with. This can be done onsite or created in our studio on canvas and sent out to you. We can design and create bespoke designs just for you. Here is one we did for CBBC Art Ninja's. Click to find out more. Here are some videos of previous projects we have worked on and created.